Protocol: PGA PLUS was applied at the rate of 2 ounces per 1000 square feet at 14 day intervals. The applications started 3 weeks prior to inoculation of the Summer Patch (Magnaporthe pose) pathogen. The product was applied in the evening and irrigated at the rate of 2 gallons per 1000 square feet. The trials were conducted on Baron Kentucky Bluegrass, which is highly susceptible to Summer Patch. The product was only applied up until the second week of August. Organica PGA Plus provided definitive suppression of an active fungal pathogen (Magnaporthe pose) on a variety of turf (Baron Kentucky Bluegrass) susceptible to that specific pathogen. Up until 2 weeks after the final application (8-12-99) PGA PLUS provided substantial suppression of the fungal pathogen. PGA Plus is a microbial system which provides the end user with a number of other benefits aside from disease suppression. 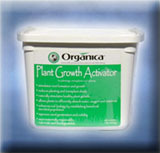 (solubilizes minerals into plant available forms, increases soil buffering properties, naturally stimulates cell division, improves nutrient absorption, stimulates root growth and formation, promotes nutrient recycling, improves soil structure, production of growth hormones, enhances seed germination and provides energy for plant metabolism). Summarily PGA/PGA PLUS provide plants with the necessary components to promote healthy growth and reduce environmental stress.